Deb's Cup of Tea: What's That Noise? I like my home office. The windows to my left provide a lovely view of the back yard and the deck. It's wonderful to watch the seasons change, the sunsets, the moon's path across the sky. In the summer, the open window brings in the sounds of summer; birds, squirrels and bugs. Even in the city, there is sound of nature. And then there are the unexpected sounds. 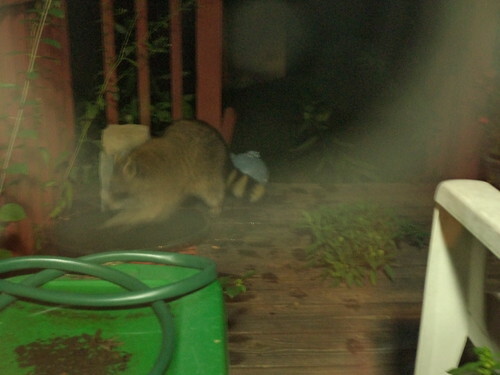 Last night, I was sitting at my desk, playing WoW and there came a snuffling noise from the deck. I heard a mild thunk, so looked out the window. Well, hello there. What brings you to my deck? The wispy nature of the photo is the reflection of the camera flash on the glass. Ah yes. This is why they showed up. They climbed into the birdbath after getting a drink. There was clunking and splashing and, as I watched, they spilled the water out of the birdbath. It was completely filled and had been visited yesterday afternoon, as I paid bills, by a couple of squirrels (or maybe the same one) and a chipmunk. 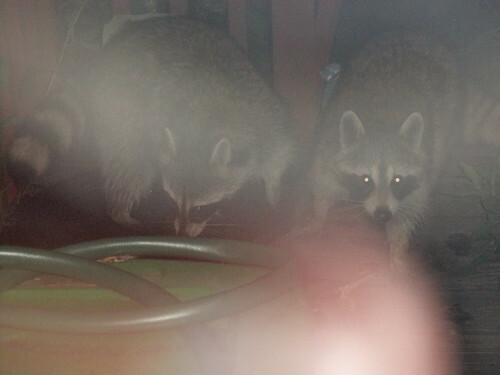 Once each of the raccoons had their drink, they ambled away. In the morning, the birdbath looked like this. Oh well. At least they weren't as messy as robins are. I'll just right it when I get home and refill it. 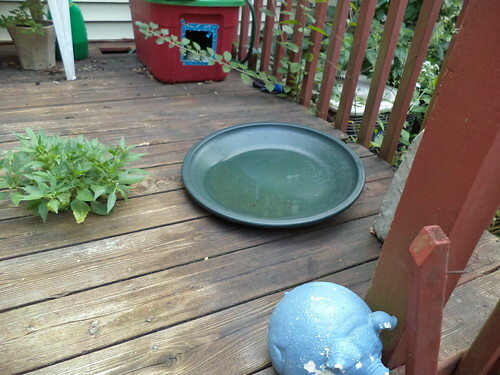 There's enough water in it for squirrels or birds to drink. Ah the joys of urban wildlife.